I have to admit, I have a really small family (like just me and my mom kind of small) so Christmas has never really been to bonkers for me. In fact, it's usually my quietest time of the year, everyone is too busy with their families to come out and play. I relish this time of year! No, that does not mean I will come entertain your crazy uncle, or cook your turkey (trust me you really don't want that!) although I could be convinced to bake cookies, that's my Holiday specialty ;) That and drinking Egg Nog. Yum. So, I've gathered some tips to help and treats to help keep you organized. As organized as possible. 1. Have a Baking Day - pick a day (I like Sundays) and do as much of your baking as possible. Cookies freeze really well and if you bake lot's, they are great for last minute gifts or treats to bring to Holiday parties (yay!) Plus how awesome will you look when unexpected guests drop by (and we all have those people in our lives) and you bring out a tray of goodies, just like that. This can even apply for meals. I'm a big fan of pre-cooking meals for the week, and this comes in super handy during the Holidays. Make it a family affair, get your kids to help out. Crank the tunes. Make it a fun time. 3. Stay away from Malls. That might not be as easy depending on where you live, but if you can either get all your shopping done early, shop smaller local shops or even do all your shopping online, you will be that much happier. Malls are HELL during the Holidays. I know it, you know, we all know it. But for some reason we forget and throw ourselves into the pit and come out 10 years older for it. 4. Tuesdays. These are seriously the slowest days of the week for anything. Best times to hit up Costco, Ikea or any big box store really, grocery shopping, best days to fly. It's not just me, someone, somewhere did studies and proved that Tuesdays are the slowest days in pretty any kind of retail or travel. Also if you are talking travel, they are usually the cheapest days to fly! 5. Stay active. Even small walks in the evening (or mornings, or afternoons) can help lower stress and help you to sweat off anything that's irritating you. Don't like the cold evenings, do whatever kind of exercise is your thing. If you're a yogi, I love the Gaia (formerly MyYogaOnline) site for hundreds of amazing classes, all online, available anytime of the day, and you can do your thing in your living room, without anyone watching. Learn to say NO. Don't over-commit, just to please others. Do Your Holidays Your way! This is the time of year to enjoy your friends and family. And say YES to help and hugs. And because I hate to leave you empty handed, I have another freebie download for you. A pretty little Gift list to help you keep your gift buying all organized. 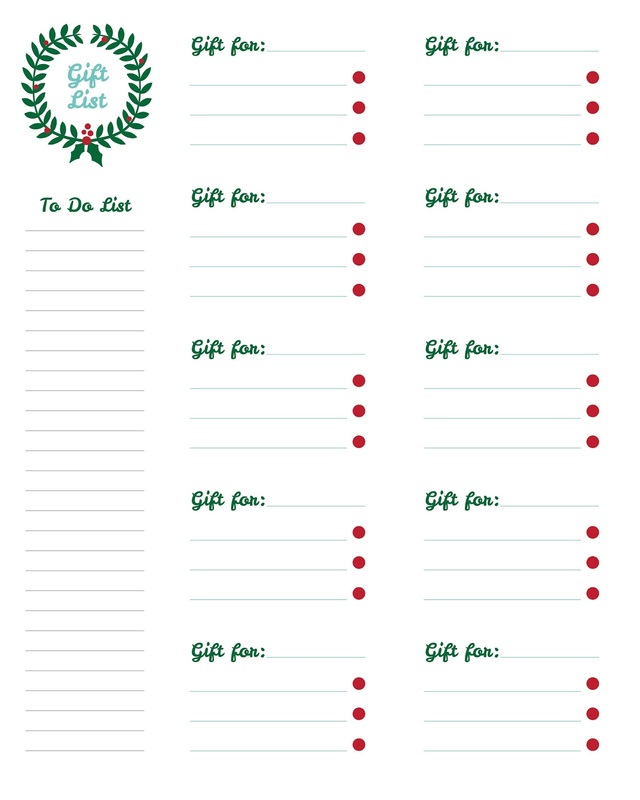 You can write down the gifts you want to get for your loved ones and check them off as you get them. just click the image and copy to your desktop. Print it out and keep it in your purse so it's always handy. Yay!